This medium sized Ponytail Palm tree (Beaucarnea recurvata) is really not a palm but a member of the Lilaceae (lily family), and is known by several names such as: Pony Tail Palm, Bottle Palm, Monja, Palma Culona, Elephant-Foot Tree and Elephant’s Foot. The Ponytail Palm has earned the name "elephant’s foot" because of its large round base sometimes appearing as an elephant’s foot. The Ponytail Palm will survive almost any lighting conditions but does best in a bright light. The Ponytail Palm is native to Mexico. The Ponytail Palms are closely related to Yuccas and thrive under the same conditions. Ponytail Palm trees are very easy to maintain and keep healthy. They are very slow growing sometimes rarely reaching the heights of 15-20 ft. The maximum average height of most Ponytail Palms is 10 ft but taking many years to do so. It is advised not to anticipate much growth of the ponytail palm when grown indoors. The Ponytail Palm trees have dark green, grass-like leaves that are close to one inch wide and can be up to 6 feet in lenght. They’re swollen bases are more for water storage and can store water up to 6 months to 1 year. The drought tolerant Ponytail palm is a great palm for ornamental placing in the home or office or landscape. The Ponytail palm does not enjoy being over watered. It is also one of the easiest palm trees to take care and suitable for xeriscaping. 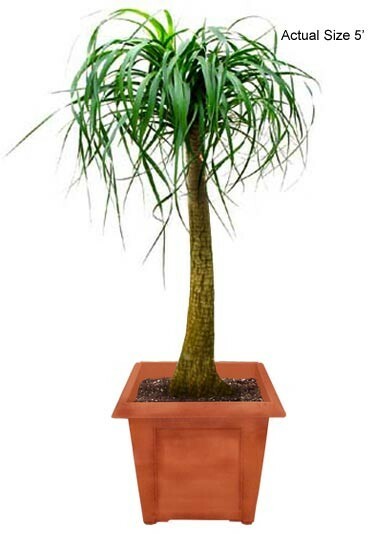 This Ponytail Palm tree will make a great addition to any home office or landscape. The Ponytail Palm will give a sense of the tropics with little cost. Palm trees are also great for indoors because they act as a natural humidifier and detoxifier by removing Carbon Monoxide and replacing the air with fresh Oxygen. 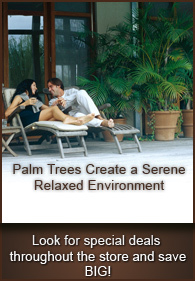 Real Palm Trees makes a home feel like home, by giving you the feel of nature year-round. Buy this Ponytail Palm tree and have a piece of unspoiled nature.